Say goodbye to your boss! 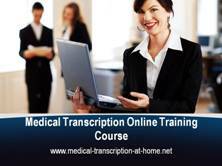 Medical Transcription At Home! The Start-Up-System for running your own home business or landing your dream job! Are you interested in medical transcription but don't know where to begin? Are you looking for better money and the opportunity to say goodbye to your boss? I've had a medical transcription at home business for fourteen years, and I can help you get started in the shortest time possible. Do you want to make your own hours? Can you work on your own? If you answered yes to these questions, medical transcription at home could be for you. It's not a get rich scheme, it does take work and commitment, but it's so worth it to have the freedom and independence that comes with it. A lot of people think about starting their own business, but don't know where to begin. Others worry about failure. You don't have to worry with medical transcription because you can start small and build up your business at your own pace, in your spare time. You don't have to give up a job to start medical transcription at home if you don't want to. That's what is so nice about it. I have enjoyed helping many people get into this business over the years; there's plenty of work for everyone. I can help you find the best transcription course or school, and teach you how to get a medical transcription job or start your own company. With the right training you can be running your own business in a short amount of time. I also offer ongoing FREE email and phone consults with no time limit, to get you where you need to be. Medical transcription at home is a real and legitimate work at home business that you can do. Not one of those awful scams that you hear about so often. Before I launched the book on this website, I used to write out pages and pages of notes for all the people I helped. Not just for people that worked for me over the years, but also for the people I met that wanted to know how to start a medical transcription business. I still get asked several times a month how I got started with medical transcription. I finally decided to write a book about it, which I finished in May 2003, and updated every year ever since. I wanted to write a no-nonsense, to the point, but in depth kind of book, that would help people get started in the shortest time possible. And so the book was born...It's not 300 pages long, full of fluff and filler, it's 119 pages full of powerful information to help you build your own medical transcription at home business. I take you from A-Z through the whole process. Click HERE to see the Table of Contents! You will learn all my secrets that will cut your typing time by at least a third and still earn you more money! I teach you how to get paid for lines you don't type, so you can make an extra $15.00 an hour minumum, for free! (Usually much more). You will learn the best courses to take so you can start your own medical transcription business in the shortest time possible. You get the actual sales letter to send out to the doctors to get accounts - the one that landed me an account every time I sent it out. You will know the best programs and books to get to help you with your work. You'll learn about the patient privacy act and HIPAA act and how to apply it to your business. You will get fifteen different sample medical transcription notes to look through to get an idea of what you'll be typing. You will be walked through an interview with the doctor and I tell you what to say to secure the account. You will walk away with all the information you need, including samples of his work to help you get started. You will hear success stories from people just like you. People I myself have helped get started in the medical transcription at home business. You will learn about various medical note formats and how to apply them to your work to save you hundreds of hours. You don't want to be typing pages of work when you don't have to. You can have this downloadable e-book and bonuses right now! You can also print them out if you want to. It's easy to download; it's as simple as saving a file. This ebook is a must-have if you want to be successful in either getting a work at home medical transcription job, or if you want to start your own medical transcription service. Every option possible has been addressed so that you can be successful in your medical transcription career! You'll love this bookkeeping guide whether you are working as a subcontractor or running your own service. It is full of lots of valuable information to help any medical transcriptionist! 15 INSTANT printable forms to help you with your business! All kinds of tracking forms, office information forms, subcontractor forms, mileage logs etc. 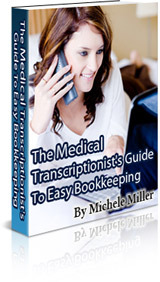 Everything you need to start keeping track of your medical transcription at home business! My Bonus Links Report, full of tons of links and loads of useful information to help you with your medical transcription work. Hours of research all in one place! Plus a list of companies that hire. You also get FREE consultations with me via email after the purchase of the book! I will help you with any questions your have about medical transcription and starting a business. This is worth more than the price of the book! You will have Email support seven days a week! Work for yourself and be the boss. You won't look back! This can be your first business tax deductible purchase! You too can be running your own medical transcription at home business! This book does not come in hard copy - It is instantly downloadable! So you can have all the information you need right now! I had to write to tell you thank you. I bought your book and immediately read it and sent out 200 letters to doctors and clinics in my area. I had an interview yesterday and landed an account for a clinic with over 200 doctors and therapists. Orders are processed through Clickbank, a secure credit card server. I offer an unconditional 60 day money back guarantee. FYI... I'm a newbie and want you to know that I started my own at-home business in June 2003 because of all your great advice, information, and encouragement. Just wanted to say thank you.... starting my own business has been the best thing I've ever done in my whole life. Michele, I know you're busy, but, I just had to write and say, AWESOME E-BOOK! It is well worth the $49.97. I am an RN, but trying to pastor a small Church. I think becoming an MT will allow me much greater flexibility. Now offering affordable Medical Transcription Online Training - Rated "A" by the BBB - Click the picture below to learn more! Medical Transcription Practice Tapes/CDs Now Available! Start your own medical transcription business and work at home! None of these copyrighted images are to be copied or redistributed. Sign up for my free newsletter and get my FREE Ebook about Starting a Business at Home! Awesome books! Thanks so much for over-delivering on the information I so much needed. Thanks so much for this ebook, and the bonus books, which were really helpful. There is so much information crammed into them that I can't believe it. I'm so excited about doing medical transcription at home now! Since investing in your home transcription ebooks, I wanted to let you know I have opened my business and now have two groups of doctors. I even had to hire two subcontractors to help me with the work-load! I meant to email you a thank you note before now. Your books totally helped me get this business off the ground, and I still refer to them frequently. I just wanted to let you know how much I have appreciated your book. I am a medical secretary and want to start a business from home. I just can't believe that a book exists to tell me how to do it step by step, and in such detail. Thank you Michele. Your Ebook downloaded without any problems. I loved it. This will be the first time I bought an Ebook and felt it was well worth the money. I can't thank you enough for writing it. I really do appreciate you being so helpful and honest. I had so many questions that you answered. I probably will be sending another thank you once I get this business up and running.